In general, text marketing for restaurants is a really. good. idea. Seriously, did you know that almost 99% of all text messages are opened within five minutes or less? That alone is reason enough to hop on the text marketing bandwagon. 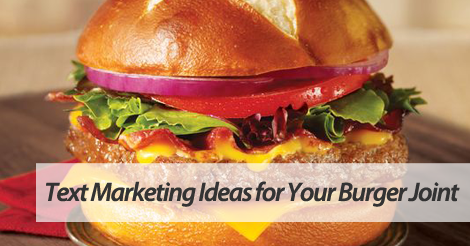 Check out some of these text marketing ideas for fast food chains. Tell subscribers about seasonal, limited time menu items. This is HUGE. Think about it. If you own a fast food joint, you probably release seasonal items that the public loves. For example, everyone loves the Shamrock Shake at McDonald’s. Why not boost new product awareness with a text marketing campaign? Don’t just fire out an announcement. Instead, offer a special discount for VIP text subscribers. Reward loyal subscribers with automated birthday treats. We love our birthday rewards feature. It’s one of those “set it and forget it” add ons. After signup, just head into your account, and switch it on. You will then be asked to set your birthday auto reply, birthday confirmation, and birthday message. Seriously, that’s all you need to do. After that, the birthday feature literally runs itself. Join forces with top SMS marketing provider, SlickText.com. Give us a buzz at 1.800.688.6290 or head over to the pricing page and sign up for a a free plan. Our learning center is packed to the brim with helpful resources that empower you, the SMS marketing user to succeed. It’s a great way to slowly educate yourself about text marketing best practices, campaign ideas, and more. Remember, there’s no rush. The more time you spend educating yourself on SMS, the better results you’ll have.